Greek Orthodox church dismisses Father Gabriel Nadaf from his post in Nazareth without bothering to summon him. An Israeli Arab Orthodox priest has reportedly been dismissed by the Greek Orthodox church in Israel, after publicly supporting IDF service for Christian Arabs. Church spokesman Essa Musleh told AFP on Thursday that the decision was made on Tuesday to fire Father Gabriel Nadaf from his post in Nazareth, and that the decision was only being made public now. "We warned him before to keep to his priestly duties and not to interfere in matters of the army," Musleh said. "When he did not heed our warning we held a meeting of the church court which decided to sack him." The priest has been active in a group founded in 2012 to support Christian IDF enlistment, leading in February to a significant rise in the Arab Christian draft over the previous six months. 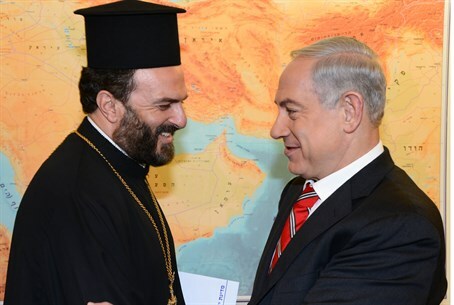 Nadaf has advocated for a strong connection between Arab Christians and the State of Israel. Nadaf's views have led him to be sanctioned by the Greek Orthodox church, while Arab MKs condemned him as “an agent of Zionism who seeks to divide Arabs." Nadaf’s 17-year-old son was violently attacked in Nazareth last December; the attacker was identified as an activist from the extreme-left Hadash party. Speaking about the move to dismiss Nadaf, Musleh stated that he was not given any written notification, but rather "we announce this now." While Nadaf confirmed that he received no official notification of being fired, he called the talk of his being fired media speculation. "The procedure for sacking anyone as a priest is to invite him to the patriarch's office where he will be presented with a letter of dismissal by the patriarch's secretary," remarked Nadaf. "I have not received any call or letter from the patriarch's office." The IDF made a landmark decision in late April to send out "voluntary draft notices" to Christian Arabs of recruitment age, giving them the option to either volunteer or decline draft services. of serving and getting involved in the country in which they live and which protects them, and in which we are full citizens." Arab MK Basel Ghattas (Balad) had a different reaction to the notices, calling on Christian Arabs to refuse to enlist into the IDF and to burn their draft summonses. In response, Foreign Minister Avigdor Liberman called for an investigation to be opened against the Arab MK, saying "those among the Christian Arabs who join the IDF face threats and violence by elements in the Arab sector." Israel's Arab minority makes up some 20 percent of the population, most of whom are Muslim. The Arab sector has become exceedingly radicalized in recent years, and phenomena like the plastering of posters praising terrorists or marching against Israeli Independence Day have become common.